If you live in the northeastern part of the country you might not realize that Spring has in fact sprung. Sure we've seen snow twice in the last week and change but there have also been baseball games. That is what I'm taking out of all this at least. 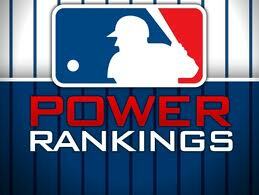 Anyway, in case the weather fooled you or you simply love baseball as much as I do, you are here and (hopefully) jonesing for some power rankings. I won't keep you waiting any longer. *Note ~ All records and stats will be as up to date as possible thanks to a few early games today. 1. Kansas City Royals (4-1) ~ For the first time in more than three decades the Royals are your defending World Series champions. That, and their 4-1 start, is enough to lay claim to the initial top spot. 2. Chicago Cubs (5-1) ~ Everyone's preseason darlings suffered a big blow over the weekend when they lost Kyle Schwarber for the season. He tore the ACL and LCL in his left knee which could open the door for Jorge Soler to garner more playing time. 3. Baltimore Orioles (6-0) ~ The O's are the last remaining unbeaten team in the league. You'd have to go all the way back to 1970 to find the last time the O's opened a season at least 5-0. They ended up winning it all that year. 4. Pittsburgh Pirates (5-2) ~ After finishing last season with the second-best record in the National League the Pirates were ousted in the Wild Card playoff game. If any team has extra motivation to win the division it is Pittsburgh. 5. San Francisco Giants (5-2) ~ For the second time in his career Madison Bumgarner homered off Clayton Kershaw who many people (myself included) think is the best pitcher in the game. He is now the 15th player to have hit multiple home runs off Kershaw. And he’s a pitcher. Baseball is great isn’t it? 6. Los Angeles Dodgers (4-3) ~ If you had three guesses as to which Dodger pitcher threw 7 1/3 hitless innings in his season debut would one of them be Ross Stripling? I didn’t think so. Either way that is what happened on Friday when Stripling toed the rubber for not just his season debut, but his MLB debut. Good on ya kid. 7. Cincinnati Reds (5-1) ~ It's easy to look at the Reds and think their record is flukey. They swept the Philadelphia Phillies to open the season. Then they took two of three from the Pirates and those same Phillies won two against the New York Mets. Maybe it's not a fluke? Eh, it probably is but for now we will give out some dap where it's due. 8. Washington Nationals (3-1) ~ It's time to see if veteran manager Dusty Baker can take this talented team where newbie manager Matt Williams could not over the last two years. As long as reigning NL MVP Bryce Harper stays healthy this team has a shot. 9. New York Yankees (3-2) ~ Starlin Castro has turned heads with his quick start in New York. CC Sabathia was serviceable in his season debut and the old guys are hitting. If all of those things hold true the Yanks could be a force in the AL East. 10. Boston Red Sox (3-3) ~ Hanley Ramirez has multiple hits in four of his first six games this season and appears to be healthy. If Boston's first time first baseman can produce like that he might be worth that big contract. 11. Chicago White Sox (4-2) ~ Mat Latos was a tire fire in 2015 finishing up a three-team season with an ERA just south of five. In his season debut against Oakland Latos twirled six innings of one-hit ball because of course he did. 12. New York Mets (2-3) ~ The defending NL champions may have left their bats at spring training. Through five games they have scored just 14 runs which is last in the National League. 13. Texas Rangers (3-4) ~ Shin Soo-Choo is hurt again. The only bright side is that top prospect Nomar Mazara has been called up to replace him. He has played only 20 games at the AAA level last season but if he peforms well (he went 3-for-4 with a homer in his debut) he could be a mainstay on what should be a playoff contender. 14. 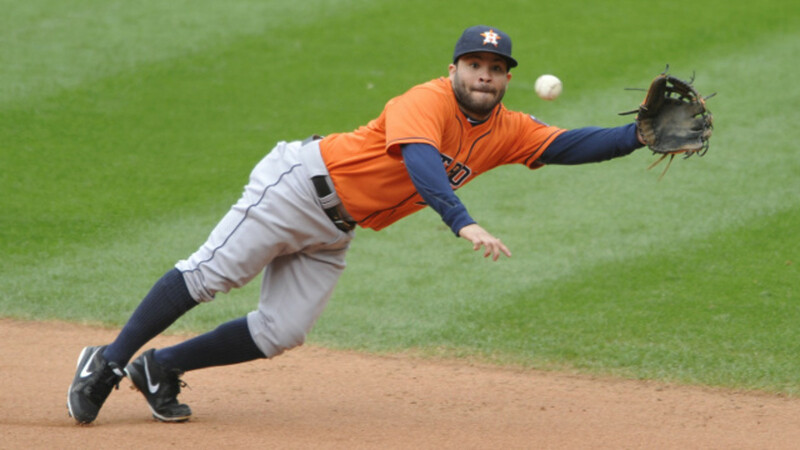 Houston Astros (2-4) ~ The Astros are off to a rough start and it begins with their pitching staff. You aren't going to win many games when you are allowing nearly seven runs per contest. That's just too much pressure on an offense even one as young and talented as Houston's. 15. Detroit Tigers (3-2) ~ When Jordan Zimmermann signed in Detroit many experts predicted a fall-off. He was moving to a league that employs the DH and saw a dip in velocity. All he did in his debut was hold down the Yankees hot bats for seven shutout innings while allowing just two hits. That should quiet the critics at least until his next turn in the rotation. 16. Toronto Blue Jays (3-4) ~ Josh Donaldson is picking up right where he left off. Last year's AL MVP already has four home runs and nine driven in. What was Oakland thinking in letting this guy go? 17. St. Louis Cardinals (3-3) ~ During Sunday's game against the Atlanta Braves it was noted that Brandon Moss had homered against every club in baseball except Atlanta. He changed that during the at-bat in which that little tidbit was mentioned. The announcer jinx strikes again. 18. Oakland Athletics (4-3) ~ A four-game sweep in Seattle while allowing just four runs is definitely noteworthy. Like the Reds, it's giving dap where dap is due. 19. Cleveland Indians (2-2) ~ All-star outfielder Michael Brantley is slated to begin a rehab assignment today. The quicker he returns from shoulder surgery the better the Indians will be. 20. Colorado Rockies (3-3) ~ Trevor Story has taken the league by storm with seven home runs in his first six games. No player has ever had more homers in team’s first six games in the history of MLB. He’s making this thing look easy and making Rockies fans say Tulo who? 21. Tampa Bay Rays (2-4) ~ The hype this season about the Rays was their young, talented pitching staff. Six games into the season that pitching staff has yet to produce one quality start. 22. Seattle Mariners (2-4) ~ Stop me if you've heard this one before. Felix Hernandez was magnificent on the mound and received no offensive help. He struck out 10 over seven scoreless innings in his most recent start and once again was left with a no-decision. New season, same old story. 23. Arizona Diamondbacks (2-5) ~ A trendy pick to win the NL West after acquiring Zack Greinke and Shelby Miller the D’Backs have fallen flat on their faces. Through four starts their two stud pitchers have given up 21 runs in 21 innings. I’m not a math major but even I can see that makes for an even 9.00 ERA. Yikes. 24. San Diego Padres (3-4) ~ After a historically bad start to the season - they were shut out in each of their first three games - San Diego's offense erupted for 36 runs over the next four while winning three of four in Denver. That's some serious Jekyll and Hyde stuff right there. 25. Los Angeles Angels (2-4) ~ There was a lot of focus on Jered Weaver's velocity - or lack thereof - during spring training. When he made his season debut he took his low 80's fastball and stymied the Texas Rangers. Maybe he can figure out how to pitch with diminished stuff. I'm sure the Angels are hoping that is the case. 26. Milwaukee Brewers (3-3) ~ Milwaukee is one of a handful of rebuilding teams in the National League and one has to wonder if new general manager David Stearns will look to trade away former all-star Ryan Braun. 27. Miami Marlins (1-3) ~ Miami has jumped all over the Mets tonight as they have scored eight times and it's only the 3rd inning. Miami hasn't scored eight in any game prior to tonight. 28. Philadelphia Phillies (2-5) ~ They are only eight wins behind the 76ers who are about to wrap up their season. I wonder how much longer until they overtake them. 29. Minnesota Twins (0-6) ~ The 0-6 start is the worst in club history since they became the Twins in 1961. Eesh. 30. Atlanta Braves (0-5) ~ The race for the number one pick in the draft is underway!